Mirko Vojnovic began a hunger strike on April 9, 2012 in front of the Santa Clara California Family Court. Mirko Vojnovic is a victim of corruption by attorneys, judges, legal institutions, and their cronies. Mirko Vojnoivic is one of the victims who will be featured in LawlessAmerica...The Movie. My name is Mirko Vojnovic. I used to be an engineer. A good one; 10 US Patents approved and two pending. I have been working hard all my life. I came to this country as a young engineer, hoping that the only laws I would be dealing with would be the laws of physics. It did not turn out that way. On February 21st, 2012, my home of 20 years was sold on foreclosure auction. In a few days I will be homeless. I didn’t lose my home because I made a bad business decision or a bad investment. I didn’t lose my home because I was living a lavish lifestyle; or because I was drinking or gambling; or because I was doing drugs. I did not, and do not, do any of those things. I was robbed, in broad daylight, by the people who were sworn to abide by the law and enforce the law. I did not allow them to take my daughter away from me. I won that battle, but lost everything else during a seven year ordeal. I have been robbed by divorce attorneys who perjured themselves numerous times. I have been robbed by judges who are protecting those attorneys. I have been robbed by legal institutions and regulatory bodies who are protecting those judges and attorneys. I have been robbed by cronies who infested our judicial system. And I am not alone. To learn more about Family Court problems, visit: Center for Judicial Excellence: www.centerforjudicialexcellence.org). I will not be a silent victim. They did not take away my dignity. I, as everybody else, deserve my unalienable Rights, to Life, Liberty and the pursuit of Happiness without oppression. myself, but also other parents and their children in similar situations. Santa Clara DA’s office to prosecute attorneys Stefan P. Kennedy and Tamara T. Costa for perjury and to prosecute other open cases against parties who committed perjury and/or are guilty of public corruption, including DDA John Chase; and sue for damages; i.e. destruction of my business, depleting of my lifetime savings and personal injuries. Attorney General to prosecute recently retired judge Neal Anthony Cabrinha, his accomplices in staged disqualification proceedings, and the State Bar cronies who protected attorneys Stefan P. Kennedy and Tamara T. Costa. Immediate processing of my claims against the Santa Clara County by Santa Clara Board of Supervisors and the State of California by California Victim Compensation and Government Claims Board. At the same time, I appeal to ValleyOne Investment, LLC who purchased my home at the auction to delay the eviction process. Today was the first day of my strike. I woke up at 7 AM, called a reporter in New York to give him an update on my situation. After I took a shower, I called a law office that advertises taking cases considering fraud. I spent half hour on the phone with them and they promised to call me back in two or three days. Next phone call was to the Serbian Consulate in Chicago to let them know that I am starting the strike and gave them instructions what I would like them to do in case something happens to me (I remind you, I’ve received death threats in the past). Just when I was ready to depart for the court, around 9 AM, I found an eviction notice placed on my door by the Sherriff. It said that I must vacate my house by midnight on Tuesday, 4/19/2012. The definitiveness of the approaching homelessness struck me like a hammer. My whole body started shaking and in spite of my attempts to remain calm, I was not able to control it. I had to sit down, but even that didn’t help. Years of constant stress finally caught up with me. I was not able to move. I found the whole situation bizarrely funny. My brain was saying “Move, this is ridiculous”, but my legs didn’t listen, and my hands were shaking uncontrollably. For years, I resisted taking anti-depressant pills doctor prescribed me long time ago, but this time I decided to take them. This was stronger than me. I popped two pills and went to bed. I was out in minutes. Woke up around noon, my body still weak, but I was determined not to be deterred by that. After all, I am a grown man with a strong will and some funny feeling in my legs never stopped me in the past. I drove myself to the friend’s house, and from there we drove to the Law Foundation of Silicon Valley. I wanted to see if they would be interested to take my case on pro bono basis. The lady who works in Public Interest Division was not there, and I was given her direct number to call her back later. From there, we went to the Court House at 170 Park Plaza, downtown San Jose. I unloaded my things, banners, garden chair, small tabl,e and Petition against fraud and perjury for people to sign. As I set up my “shop,” a new wave of strength overflew my body, and I was ready to roll. Some of the Court sheriffs recognized me and greeted me with a smile. That felt nice. I was always pleasant with them in the past and ready to pop the joke. They took good care of me when I had my last strike two years ago. I felt good and ready to engage people who were passing in and out of the court to sign my petition. I will talk about those encounters more in my next diary logs, but I must mention two cases today. First, it was a guy in his thirties who literary cried in front of me; he also lost everything due to false accusations he had to endure for three years of divorce proceedings, and the only thing that prevented him from becoming homeless was that he still has his mother who took care of him when he was down. He is still fighting for his son that he claims his ex neglects and leaves him for days unattended with some distant relative when she takes off on vacations with her new boyfriend. There was also a lady with four kids who experiences the same treatment from her ex, for whom she claims that he is a drug addict. Her youngest son who was jumping all over the place had a chocolate mustache, which was cute, and we joked about that. It felt good. People were talking to me, telling me their stories, as if they finally found somebody who would listen to their problems. One guy even called me “his hero.” Go figure; me and a hero in a same sentence. Eat your heart out Chuck Norris. Friend of mine picked me up around 5 PM, and I went home. I was done for the day. My girlfriend came around six, and that gave me more strength. We spent a cozy evening talking and watching TV. First we watched NCIS, which was a “boy’s” stuff, and then we watched some “girly” stuff on Lifetime channel. Then it was time to go to bed. Tomorrow is the new day. 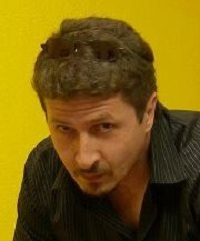 Mirko Vojnovic will be one of the victims filmed for Lawless America...The Movie.